Hi, this is fascinating. What kind of software do you use for these exact mathematical analyses? Thanks Ralf. In the absence of multitracks it was neither automatic nor definitive. But essentially I used transient detection on a sonogram in various frequency bands (audiosculpt I think? 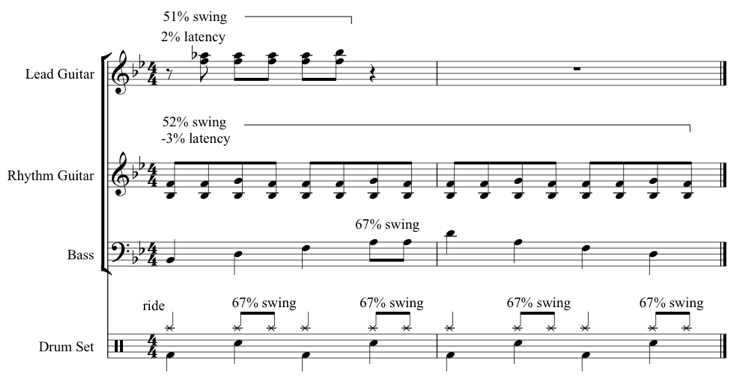 It was back in 2008), then (as explained in my thesis) used simple maths to calculate swing and latency values. These gave me timings that I could put in MIDI (Logic Pro) to check against the original. I checked informally with various percussion colleagues on the ‘feel’. and made the rudimentary MIDI realisations. I think that the straight guitar vs swung rhythm section concept is (for me) extremely convincing although readily accept the limitations (and usefulness) of minute gradations. Thanks for sharing this! I’m not able to listen to the audio clips, even after updating flash. (in chrome, a message says to update flash player, even immediately after update) Would love to hear them though! Apologies. Could you try now? As I listened to Johnny B Goode and noticed the swing drums vs the straight guitar, I thought my ears must be deceiving me, but then I found your article which confirmed my impression. It’s very interesting work and it has made me rethink what I thought I knew about timing; thank you for sharing it.